Containing a sprinkling of faery magic! 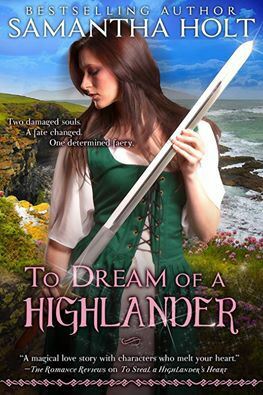 To Avenge Her Highland Warrior, the third and final book in Samantha Holt’s Highland Fae Chronicles is a sensual and heart rending captor/captive romance. It can be read as a ‘standalone’, although I do however, highly recommend the whole series (check out the links below). The novel is a combustible mix of revenge, passion and redemption, sprinkled with a little fairy magic and I loved it! It contains a dark, torn and tortured alpha hero and a strong and vulnerable heroine who belong together, but who fate has torn apart. The faery Tiele, determined to put this wrong to right, has a battle royal on her hands to reconcile these two lovers due to events that have transpired. Her task is all the more difficult for she has sworn off the direct use of her powers, as the use of such magic in the past has resulted in unforeseen consequences. As soon as the book opens I was drawn in – the heroine Lorna, who is widowed, is in dire straits, captive in the bowels of her former home that was brutally wrestled from her by her brother-in-law. Having failed in her mission to kill this usurper she now awaits his punishment. Imagine her surprise and relief when she finds that the man in charge of the keep whilst its master is absent is none other than Logan, the man who once loved her, the man who she had rejected and believed slain in the battle for her home. Yet there is no happy reunion between the couple as this man is a far cry from the Logan who adored her. Instead he is a cold and distant stranger, his memory erased by the injuries he sustained during battle. He views his captive as little more than the spoilt and manipulative woman his Laird tells him she is, and he does not recall how he once loved his former mistress from afar. Whatever Lorna says she cannot help him remember or trust her enough to believe her – he views whatever she says as lies, designed to save her own skin. Although attraction between them simmers, Logan is determined not to betray his Laird and succumb to this woman. However, he slowly comes to respect her combination of strength and vulnerability and becomes torn once he finds out what his Laird’s plans for his captive may entail. There are scenes aplenty of sexual tension, frustrated passion and love making which brings them ever closer, but not close enough, as Logan fights the connection that exists between them. Will he act to save her? Will he remember their love before it is too late? Even if he does, can Lorna accept him for the man he has become and forgive him for what he has put her through? I so felt for both these characters in this book! Lorna had lost so much, yet she is strong and resilient in terrible circumstances, especially as the very man who should have been her saviour is now her gaoler and is a stranger to her. She is fearful for her own future and that of Logan, who seems lost to her and her emotions oscillate between hope and despair. Logan is as tortured a hero as they come and is torn between loyalty to his Laird and what he is beginning to feel for the captive. I also enjoyed the supporting characters in the tale, especially Lorna’s self-serving brother-in-law, whose actions added tension to the plot and of course Tiele whose presence and antics contributed to some humorous moments to the plot in her efforts to save the day. All in all, I found it a sensual, heart stopping and entertaining read and a great conclusion to the Highland Fae Chronicles. This entry was posted in Historical, REVIEWS (ALL) - Reverse Chronological Order, Romance and tagged captor-captive, highland-fae-chronicles, magic, samantha-holt, scotland, scottish-warrior, to-avenge-her-highland-warrior, tortued-alpha, vulnerable-heroine.